Compared with other type gantry crane, the type aluminum gantry crane is finally granulated with high-strength aluminum alloy’s extruder. This humanized design maximum reduces the movable parts weight of a aluminum gantry crane, leaving a bigger capacity gantry crane. Due to these so many advantages, the aluminum gantry cranes play a very important role in poor working environment to transport goods frequently. 1. The entire gantry crane is finally granulated with aluminum alloy’s extruder, which owns a special cross section design of rail. 2. With the high-class aluminum, our gantry crane enjoys the lightest dead weight; almost reduce 45% when compared with the other rail mounted gantry crane. 3. Our customers will decrease their spending budget by adapting the steel foxed type rail under the modular design. 4. The more flexible working position give a benefit for assemble and extension. 5. 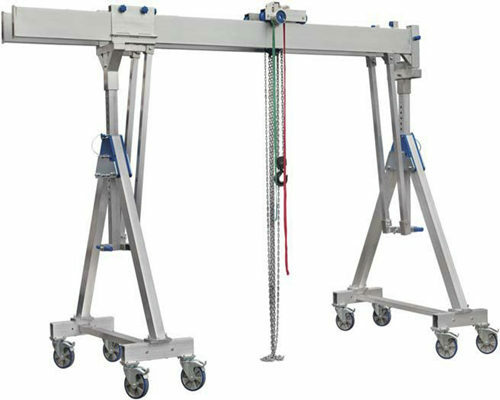 An aluminum gantry crane will be orientation accurately and precisely by the special rail design. 6. With the longest span, this can reach 10 meters or even more. 7. Using the bolt to connect the parts of an aluminum gantry crane, leaving a safe and solid gantry structure. 1. Five years quality guarantee. Most of our gantry cranes all enjoy five-year warranty, which is the best promise in crane industry. 2. The unique geographical advantages guarantee the fast delivery. There is zero error of our delivery according to analyses these data for the six past years. This is also the highest index that no competitors can reach. 3. Easily installation and maintenance. We manufacture the parts of our aluminum gantry crane by the way of stationary fixture to ensure easily assemble and movement. 4. High safety and zero accident. 5. With sales worldwide and service nationwide, maximum save our customers’ transportation cost. 6. Mature sales net and professional engineers group promise the entire problem solved timely and efficiently. 7. Multi-function. Ellsen has a series crane production line to manufacture diverse kinds of gantry cranes meet all your requirements. First is the most common small gantry crane, which mainly adapts the box or truss structure with extensive utilization. The spans of this kind of gantry crane vary with several different working environments, is designed to move, lift or transport the materials below 100 ton with the lowest span 4 meter and the biggest span 39 meter. Usually, a gantry crane with the grab enjoys the higher working duty. In a word, the common gantry crane mainly refers to the hook, grab, magnetic and hoist gantry crane, sometimes, the semi portal gantry crane is also contained. Second is the hydro power station gantry crane with bigger lifting capacity from 80 to 500 ton. However, hydro power station gantry crane has slower speed and litter span when compared with the common gantry crane. Thanks to the heavy work the crane has to engage, the working duty of hydro power station gantry crane is higher. Third, the double girder gantry crane widely used in shipyard, usually called the shipyard gantry crane. This kind of gantry crane always has two extra trolleys and hooks to ensure high working efficiency and productivity. As the crane to assemble ship, shipyard gantry crane has a bigger lifting capacity from 100 ton to 1500 ton.